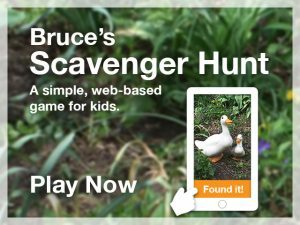 Way more than just plants call Bruce’s Garden home. Grab your grown-up and their smartphone and see if you can spot some of the garden’s lesser-known sights. When you see the object in the picture, simply tap “FOUND IT” to go on to the next one. There are five objects to find every week. And, of course, don’t forget to stay on the path!